You want a fillet to taste vaguely of the ocean so as to distinguish it from meat or chicken. But at the same time, it shouldn’t be too . . . fishy. No wonder, then, that mackerel doesn’t much figure in when people are figuring out what to cook during the six-week Lenten season. Blessed (or some may say cursed) with rich, full-bodied meat, mackerel is one of your oilier fishes. That translates into a fillet that’s more assertive tasting than Alaskan salmon or Icelandic cod. That is, if you’re eating small Atlantic (Boston) mackerel, or the giant king mackerel, which can reach 100 pounds and is such a voracious eater that the fish sometimes can be seen leaping out of the water in pursuit of prey. Not so with the mid-sized Spanish mackerel, a species that can be found from Cape Cod to North Carolina to the deep waters of the Gulf of Mexico. It’s got the same razor-sharp teeth and silvery skin as its larger brethren, along with beautiful yellow spots on its iridescent blue-green skin, but the taste is much, much milder. So much so that even those who normally only will take a chance on fish that is white, flaky and delicate-tasting might ask for seconds and maybe even thirds after they sample it for the first time. That’s right: I liked the Spanish mackerel escabeche that Penn Avenue Fish Co. owner/chef Henry Dewey prepared for me in hopes of changing my mind about fishier-tasting fish. So much so that I made it again for my husband that same night — and had the leftovers for breakfast the next morning. I also really enjoyed a piece of roasted Spanish mackerel dipped in ponzu sauce, and discovered I could eat a raw slice of it on top of rice as nigiri without, you know, gagging. It was surprisingly clean and pleasant-tasting for raw fish. Spanish mackerel is one of the most commonly caught species off the Southeast coast, yet it still accounts for just a small percentage of total mackerel landings in the United States. That may explain why it’s difficult to find the fish on local menus, other than as an occasional daily special, and why it’s not often included in mainstream cookbooks. Still, Penn Avenue sells about 65 pounds of the fish each week, and the amount is slowly increasing as more people become acquainted with all it has to offer, says Chef Dewey. One of the biggest pluses is its health benefits. High in protein and low in calories, Spanish mackerel is extremely rich in omega-3 fatty acids, which are thought to protect against heart disease and possibly stroke. Chef Dewey says, “It’s super, super good for you” so long as you keep it to just a few servings a month. Because of its elevated mercury level, Spanish mackerel is under a consumption advisory for pregnant women and children issued by the Environmental Defense Fund. When you do enjoy it, though, it can be with a clear conscience: Spanish mackerel gets a “best choice” recommendation on Monterey Bay Aquarium’s Seafood Watch list because its fisheries are well managed, and the year-round catches are plentiful and healthy. Spanish mackerel also is comparatively inexpensive — in addition to Penn Avenue Fish, where it sells for $9.99 per pound whole, it can be found locally at Giant Eagle Market District, Wholey’s in the Strip District and Whole Foods for between $5.99 and $6.99 per pound. Wherever you buy, make certain the fish is extremely fresh, as the oil that makes its off-white flesh so flavorful also makes it spoil very quickly. Improperly stored (it has to be kept cold), mackerel is susceptible to scombroid poisoning, a foodborne illness with symptoms ranging from an upset stomach, headache and diarrhea. How to tell if a mackerel is good to go? The flesh should be shiny and firm but not spongy (it shouldn’t stay sunken when you poke it), its eyes clear and the gills a rich pink color. Also, it should smell clean and briny instead of fishy. Take a pass if it’s beat up around the edges: that means it’s been bruised on its journey from the ocean to the store. Spanish mackerel average between 2 and 4 pounds, and because their silver scales are extremely tiny, they don’t have to be scaled, unless you plan to eat the skin, which you probably should leave on while cooking to help keep the fish intact. Some will cut the dark, central “blood line” at the top of the fillets before putting them into a pan (I pulled the brownish meat off with the skin after cooking it) but otherwise, it’s pretty easy to clean. The meat is firm enough that it can be cooked in a variety of methods — grilled, fried, barbecued, broiled or roasted — and it pairs exceptionally well with Asian and Mediterranean spices, standing up to spicy curries and vinegary sauces. Remember: It’s best when cooked within a short time of being caught, so don’t let it languish in the refrigerate. Spanish mackerel also can be eaten raw in sushi or sashimi, or marinated in lemon or lime juice with chiles and salt for ceviche. And it’s wonderful smoked, says Chef Dewey, who likes to stuff the fish with fresh herbs and roast it after drizzling it with melted butter and a dusting of paprika. This is a good recipe for those who believe mackerel is too oily; the hot-and-sour marinade cuts through the fatty richness of the fish beautifully. Combine horseradish and yogurt in a bowl. Season the mixture with salt and black pepper. Mix the mustard with the lemon juice and vinegar, and stir in the lemon zest. Add this mixture to the yogurt. Coarsely chop the parsley and stir into yogurt mixture. Taste the sauce: the mustard and horseradish make it hot (it will lose some heat when cooked), the vinegar and lemon juice make it sour, and it should also be a little salty. Preheat broiler. Lay mackerel fillets skin-side down on a baking sheet and spread with horseradish, lemon and mustard sauce. Place fish under the broiler for 4 to 5 minutes, until sauce is caramelized on top and the fish is cooked through. Serve as a starter with a mixed leaf salad. Serves 4 to 6. Place boneless mackerel fillets skin down on a roasting pan covered with aluminum foil. Season generously with the blackened seasoning. Place in hot oven and roast for 8 minutes, or until just barely cooked through. Make sure not to overcook. In a medium skillet, heat olive oil. Add carrots and red onions and heat gently until veggies are soft. Remove from heat. Add apple cider vinegar and a pinch of salt and pepper. Add toasted, ground coriander seeds. Add sliced Meyer lemon with some rough chopped cilantro and toss to mix. Place the cooked fillets in a decorative dish and pour the dressing over the top of the fish. Refrigerate for 30 minutes or up to 3 hours, spooning the dressing over the fish occasionally. Serve cold or at room temperature with crackers or on top of cooked angel-hair pasta. Serves 4. — Henry Dewey, chef/owner Penn Avenue Fish Co.
Having spent many hours as a kid and teenager pier- and surf fishing for mackerel on the Atlantic coast of Florida, I was tickled to get my hands on a beautiful whole (already gutted) fish from Penn Avenue Fish Co. It was too big for any of my pans, so I roasted it with its tail sticking out one side and its toothy head hanging out the other. But it cooked up perfectly using this recipe, meant for smaller mackerel; it also can be used on herring and trout, though as the cookbook notes, mackerel “takes assertive flavors well.” Don’t fear cooking whole fish. To me, there’s something almost sacred, and certainly special, about experiencing food this way. And it tastes good, too. Harissa paste is a condiment of hot peppers that you can find at specialty stores, or you can whip up your own blend; I made some with piment d’Espelett pepper, paprika, cumin, coriander and olive oil. Preheat the oven to 400 degrees. Lay the mackerel in a roasting pan, then mix the harissa paste with half the oil. Drizzle this over the fish, making sure the mackerel are covered inside and out. Add the limes to the pan, then toss the potatoes with the remaining oil and add them to the pan, too. Roast in the oven for 20 to 30 minutes, or until the potatoes and fish are cooked through. Scatter with the cilantro, and serve with a crisp salad. Stuff the belly cavity of the mackerel with scallions and fresh herbs. 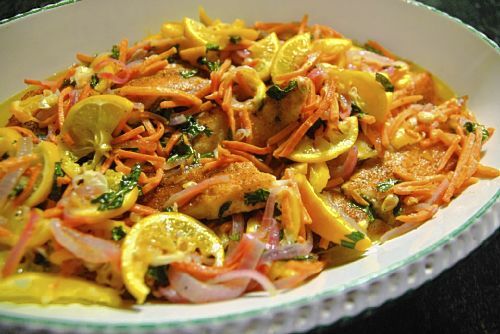 Score the sides of the fish 3 times and place a medium half-slice of lemon in each score. Place fish on an aluminum foil-covered sheet pan. Rub the outside of the fish with extra-virgin olive oil, then sprinkle with salt, freshly ground black pepper and a generous amount of paprika. Then drizzle with melted butter. Place in oven and cook for 12 to 15 minutes, or until the fish is cooked through. Serve with steamed vegetables and brown rice. Serves 4. — Henry Dewey, chef/owner, Penn Avenue Fish Co.